Why aren't we all like that wise old bird?" They say at Halloween, a witch's companions are the cat and the owl. The owl's screech is thought to sound like the cackle from a witch. In Ancient Rome, owls were thought of as evil, or at least harbingers of evil. However, in Ancient Greece, the goddess Athena - the goddess of wisdom is attended by an owl. Perhaps that is how the association of the wise owl began. It does make sense that during the Middle Ages, when one walks a dark and lonely road, a glassy stare of an owl would scare the dickens out of some people. The screech owl in particular made people of that time think of witches. Since witches were thought to be able to assume other shapes, an owl seems like a likely candidate. 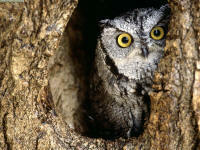 Nestled in a hollow tree, the screech owl's call seemed rather witchy. There was once an old castle in the midst of a large and dense forest, and in it an old woman who was a witch dwelt all alone. In the day-time she changed herself into a car or a screech-owl, but in the evening she took her proper shape again as a human being. She could lure wild beasts and birds to her, and then she killed and boiled and roasted them. As scientific and less superstitious we are today, many people still feel that the sight or sound of a screech owl foretells something bad about to happen. The poor misunderstood owl. "I rejoice that there are owls. Let them do the idiotic and maniacal hooting for men. It is a sound admirably suited to swamps and twilight woods which no day illustrates, suggesting a vast and underdeveloped nature which men have not recognized. They represent the stark twilight and unsatisfied thoughts which all [men] have." An extremely rare species of tiny owl has been seen in the wild for the first time! A boy approaches a turtle and asks the turtle how many licks does it take to get to the Tootsie Roll center of a Tootsie Pop. He says he's never made it. He advises for him to go to Mr. Owl. So he asks Mr. Owl the same question: how many licks does it take to get to the Tootsie Roll center of a Tootsie Pop. Mr. Owl tries it out. He licks once, twice, and then after three licks, he bites into it. He then tells the hapless boy, "Three." Hedwig is the name of Harry Potter's pet owl in the fictional Harry Potter series of books and films. Hedwig is played by a male snowy owl. Hedwig was a gift to Harry from the character, Hagrid in the first book of the series. Hagrid purchased Hedwig in Diagon Alley while shopping for supplies for Harry's first year at Hogwarts. The name Hedwig is a name Harry found in his school book "A History of Magic". Woodsy Owl Give a hoot, don't pollute! 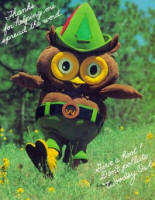 Woodsy Owl is the United States Forest Service mascot created in 1970 by Forest Ranger Chuck Williams. Many children of the 70's can still sing hum the song "Help Woodsy Spread the Word" which was played on television hoping to foster responsibility to our environment and to appreciate nature. In 2006, Woodsy Owl was updated with a new image and a new slogan: Lend a hand — care for the land! Owl is one of the animated characters that live in Hundred Acre Wood in A.A. Milne's Winnie the Pooh. 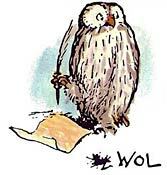 He is a stereotypical wise and thoughful owl who is talented in such things as writing and spelling, though he spells his name Wol. He is always willing to impart anecdotes and advice to his friends Pooh, Piglet and the others. He rather enjoys making speeches even while nobody listens. He lives in a place called The Chestnuts, a beautiful place right in the middle of Hundred Acre Wood. Archimedes the Owl is the pet of Merlin that helps teach King Arthur the way of birds in T.H. White's The Once and Future King. However, Archimedes is best known in Disney's The Sword in the Stone. He is a talking owl and helps Merlin to educate young King Arthur in this 1963 animated movie.